globalFEST has been a staple of the New York City music scene for the last 15 years. The one-night global music showcase spotlights a dozen artists from around the world that even die-hard music fans likely haven't seen with their own two eyes. This year, globalFEST took place across two venues — BB King's and the Liberty Theater in midtown Manhattan — and three stages. And to my ears, the most exciting artists were those who re-imagined traditional styles in stunning new ways. Two bands that brought this creative energy played consecutively — and could not have represented more of a sonic whiplash. The Jarlath Henderson Band are from Glasgow. Henderson, the band's singer, relocated there from Northern Ireland and found the musicians he needed to complete his vision. He sings traditional Celtic ballads — love and murder are major plot points, usually connected. He plays guitar and pipes, including wheezing bagpipes. But it was the band's keyboard and electronics that brought something new and otherworldly, often quieting the crowd. Meanwhile, across the street, Jupiter and Okwess, a seven-piece band from The Congo, took the stage in multi-colored ragamuffin style. Their take on subverting the traditional was much more in-your-face. 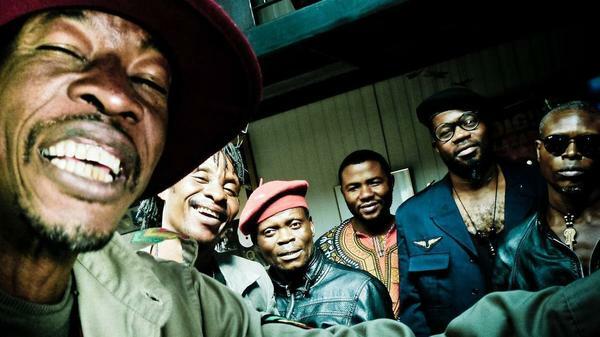 Jupiter Bokondji led his band through a set that combined funk and rock with chiming soukous guitar and four-part harmonies. This was the freshest set of the night. It wasn't surprising to learn after the fact that Bokondji's latest album, Kin Sonic, featured Damon Albarn on keyboards. Another highlight included Parisian band Delgres, which combined music from the Caribbean island Guadeloupe with New Orleans sousaphone and drums. The trio had the sweaty drive of a up-all-night Crescent City dance hall. As straight-ahead as Delgres were, La Dame Blanche brought things back to the theatrical. Cuban singer and flautist Yaite Ramos Rodriguez took the stage in all white (and a cigar) and began the set with a somewhat-classical moment on her flute before steering the show toward dancehall and hip-hop. Listen to clips from these four acts in the audio player at the top of this story.